Fortean London is the London of strange histories, folklore, unique people, outsider ideas, ghosts, monsters and more. Take us by the left hand and hold on tight. Opposite Cannon Street station sits the London Stone. Grey, dusty, set behind a metal grill in an abandoned office block, the stone is about the size of the television that well-off families kept in their kitchens in the early nineties. The earliest mention is in, possibly, 1098, but everyone agrees that the stone is old. The sober theories suggest the London Stone is the marker for the centre of medieval London, a Roman milestone, a place where debts were paid, a stone notice board or the last remaining stone from the first Lord Mayor’s house which was the only stone building in the city at it’s time. The more drunk / off-their-nut ideas mutter about the London Stone being the last remnant from a stone circle on Ludgate Hill, that Brutus, the Trojan immigrant Britain is named after, brought the stone with him when he arrived as an altar base. Others say that the stone is part of an intricate pattern of ley-lines and all that that 20th century mythology entails. The strongest idea about the London Stone, as Steve Roud points out in London Lore, is that the stone is seen as an omphalos for London. "So long as the stone of Brutus is safe, so long shall London flourish," says the proverb (coined in 1862). If it is harmed or moved, terrible danger with befall the city. When, in 2006, the shop occupying the stone's current building was being demolished, the shop-owner Chris Cheek felt compelled to stop a builder putting a chisel to the London Stone. "I'm not into hocus pocus, but," he said "there's something special about it." The stone is there now, at 111 Cannon Street, and it still attracts those who venerate it. Passing in September 2009 we saw petals left behind the grill as a floral offering for the stone. 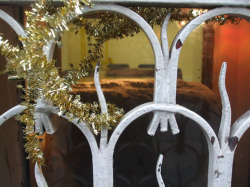 Someone had decorated its grill with tinsel for Christmas 2009. The are tales of the stone being moved to the Museum of London or incorporated into the redeveloped Cannon Street station but we shall see. The stone has even been given a 'voice' on twitter. We're confident that twitter is another thing the London Stone will outlive.